Genetic mutations in lung cancers make cancerous cells in the body resistant to standard treatment therapies such as chemotherapy and radiation. 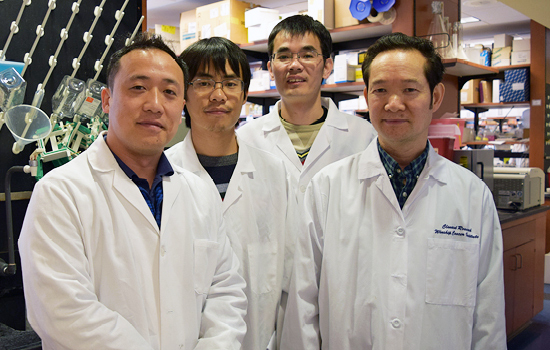 Winship cancer biologist Xingming Deng and his lab have identified two novel agents that could reverse the resistance of cancer cells to treatment. Deng is the principal investigator of two R01 grants from the National Institutes of Health aimed at investigating these agents, and totaling over $3.6 million. Deng is hoping that a new class of anti-cancer agents will lead to the improvement of lung cancer outcomes and survival. If successful, Deng will have developed two novel targeted therapies for lung cancer as well as for other common malignancies such as multiple myeloma, leukemia, and breast cancer. Deng anticipates these new lines of therapy will be ready for clinical trials for patients at Emory by 2020.